Benjamin Severson was incensed. The work he’d devoted so much time and energy into had been undone. Despite many critics, Severson, a civil engineer and foreman under Montgomery Meigs for the construction of the new Capitol dome, had stridently pursued re-dredging the Washington Canal, confident it would be a vital component of Washington’s booming economy. Rare 1847 depiction of horse (or mule)-drawn barge on the Washington Canal, titled “Elements of National Thrift and Empire”; lithograph published by by Edward Weber & Co. of Baltimore after Joseph Goldsborough Bruff. courtesy, Library of Congress. Matt Gilmore has done Washington history a service with his excellent account of the tug-of-war over the fate of Washington canal through several decades of the 19th century until Alexander Shepherd instructed the Board of Public Works, which he headed, to fill in the canal and build a sewer parallel to it. This subject deserves more public awareness, since canal closure was Shepherd’s one significant deviation from implementation of the L’Enfant plan for the capital. No doubt Shepherd was “high handed” as were most of his moves. But a report to the Smithsonian (that had reason to hate the Canal) found that the Canal was actually only operative 3 out of its 40 years in existence. River hydrology dictates that placinq a Canal at a site of sediment deposit was doomed to failure and would always lead to perpetual pleading to Congress for dredging from the timber and coal interests. In any event, the Canal became the repository for the city’s sewage and stormwater. The putrefying mess became a major source of cholera and malaria in the city. It was probably well to let this element of L’Enfant’s Plan go. 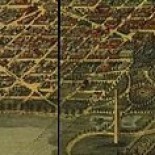 This entry was posted on March 22, 2016 by dchistorystuff in Alexander R. Shepherd, Archaeology, Arlington County history, Capitol Hill, City of Washington, Civil War, DC economy, DC History, DC Neighborhoods, Development, Early Washington DC, Early Washington history, Foggy Bottom, Georgetown, History, Mapping, Maps, Photographs, Planning, Smithsonian, Streets, Transportation history, Urban development, Washington Canal, Washington DC, Washington DC architecture, Washington DC canals and tagged Archaeology, City of Washington, D.C., DC economy, District of Columbia, Foggy Bottom, Maps, Washington DC, Washington DC history.